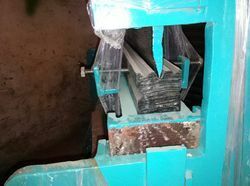 We are aupplying Press Brake Machine tools such as Blade and V block as per requirement. Product description: Backed by rich industry experiences, we are highly engaged in offering a premium quality range of Press Brake Toolings. We have gained recognition as an eminent enterprise, devotedly engaged in manufacturing a broad range of Press Brake Tooling. Press brake tooling is used in cold-forming metal sheets or strips into desired sections. We are a fast growing manufacturer, exporter of fine quality press brake gooseneck punch in Ahmedabad, Gujarat, India. We are specialized in offering Special Press Brake Tools to our customers. The special forming tools for press brakes can perform to give required shaped bending to sheet metal like Z forming, hinges, etc. Press Brake Tooling, Adjustable Dies, Punches, Die Holders, Accessories, Hamming Tools, Radius Tools, Clamps, Lower Adaptors, Tooling Cabinets. Our company is recognized as an excellent name of Press Brake Equipment. We always adhere to industry rules and guidelines during the manufacturing of this product. This product is composed of finest quality of raw materials and goes through multiple rounds of quality checks before it is sent out for dispatch and delivery. Our valuable customers can avail from us a highly qualitative Acute Punch within the stipulated frame of time at very affordable rate. Being a customer oriented organization, we are deeply engaged in offering a wide array of Press Brake Tool.